Over the past year, the N-E-W Trio has emerged as one of the nation’s most promising young ensembles after winning grand prize at the 61st Coleman National Chamber Music Competition in Pasadena, California and first prize at the 2nd Plowman National Chamber Music Competition in Columbia, Missouri. The trio has presented concerts in New York, Maine, California, and Missouri, including in the Juilliard School’s Chamber Music at Alice Tully Series, with the Bangor Symphony Orchestra, and at the Kneisel Hall Music Festival and Bösendorfer New York. In April 2007, the N-E-W Trio performed at memorial for famed political historian Arthur Schlesinger at the Cooper Union Great Hall in New York City, where speakers such as Lauren Bacall, Henry Kissinger, Senator Edward Kennedy, and former President William Jefferson Clinton participated. 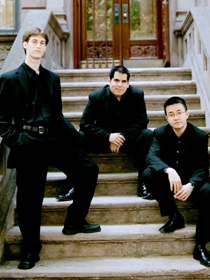 Formed in 2006 at the Juilliard School, the N-E-W Trio has worked closely with pianists Joseph Kalichstein, Seymour Lipkin, and clarinetist Charles Neidich. The group’s members have collaborated in performance with Cho-Liang Lin, Jane Coop, Andrew Dawes, Bonnie Hampton, Kathleen Winkler, and the Juilliard String Quartet. Committed to the music of the twenty-first century, the trio commissioned Juilliard School composer Michael Stephen Brown for his second piano trio, and gave the premiere performance in March 2007. In addition to concert activities, The N-E-W Trio is part of the Gluck Community Service Fellowship at the Juilliard School, performing twelve concerts a season in hospitals, retirement homes, shelters, and inner city schools.